Home > Rides To Thrill! Orlando is just exploding not just in real estate growth but in new entertainment options as well. New rides are being revealed at a lot of the theme parks new large hotels are under construction and new rides are landing along International Drive. International Drive seems to be a hot spot for new attractions and restaurants! The Orlando Eye observation wheel which stands 400 feet tall will now have a second exciting attraction along the strip! 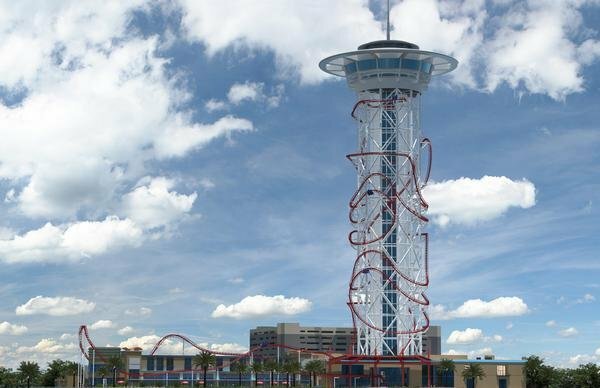 The world’s largest roller coaster attached to a support structure is coming to International Drive! Standing over 460 feet into the sky the Skyfall Drop Tower will be a roller coaster you won’t soon forget! !